JP Displays and Exhibitions are established exhibition stand designers who provide custom built exhibition stands in Poole, Dorset. 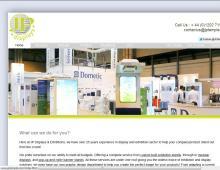 Exhibition displays - bespoke systems tailored to clients needs. Portable display systems - twist stands, Grasshopper roller banners, link roller banners and banner stands. Modular exhibition stands - including the T3 display system. Pop up display stands - ideal for different locations. Shop fitting - specialist showroom and professional shop fitting services. Exhibition display hire - Products include panel hire, modular seating, tables and chairs. JP Displays and Exhibitions graphic design department can provide a total company rebrand or use existing designs adapting them to clients requirements.